Happy Holidays! Hope that all of you are doing well and enjoying this busy time of year. The COASST office is a bit quiet this month, as most of our fantastic 22 interns are off enjoying winter break. We’re looking forward to having them back in January! If you’re on the COASST mailing list, keep an eye out for the 2014 COASST Holiday Card, which should be reaching mailboxes sometime soon! If you aren’t on our mailing list and would like to be, just let us know. One wing leaves us only one option: the wing key (or table)! Choose gray (go to Q25), choose dark wingtips with white windows and fingernails: Mew Gull is the only one that fits! Only one of these has a white “knuckle” band across the primaries (from the feather tip, a white-black-white-gray pattern). We can eliminate the WEGU, HEGU and CATE (wing chord too large). Now we’re left with MEGU, RBGU and CAGU – only the MEGU has a white “knuckle” band across the primaries (from the feather tip, a white-black-white-gray pattern). Webbed (go to Q2), completely webbed (go to Q3), 4 toes, all webbed: Pouchbills (PB1). Only one has yellow-orange facial skin: Double-crested Cormorant (DCCO). Only one has a yellow-orange bill with similar-colored facial skin and throat pouch: Double-crested Cormorant (DCCO). For those of you who surveyed following the big storm that affected the lower states last week, was your experience like Mike and Chiggers’ at Mosquito and Goodman beaches on December 14th? 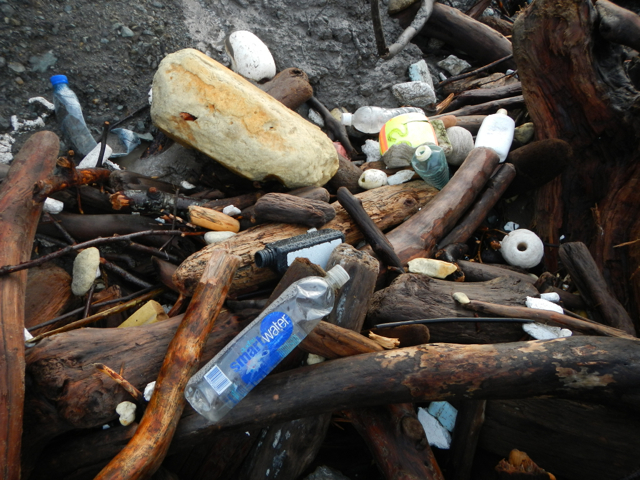 They found a “wreck” of foam, rope fragments, and plastic bottles (hundreds!). Have you seen any interesting fish wash in to your beach? 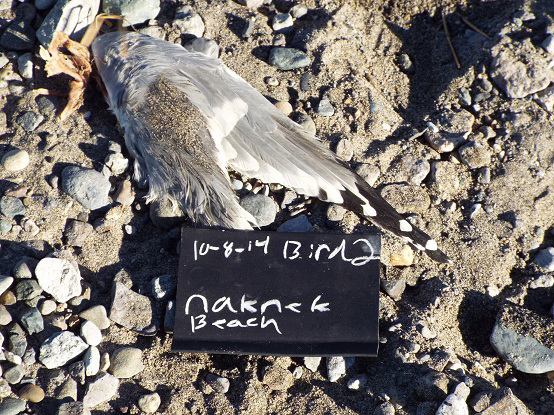 Take a look at this one found by Julia at Cowlitz Bay (WA) on December 7. 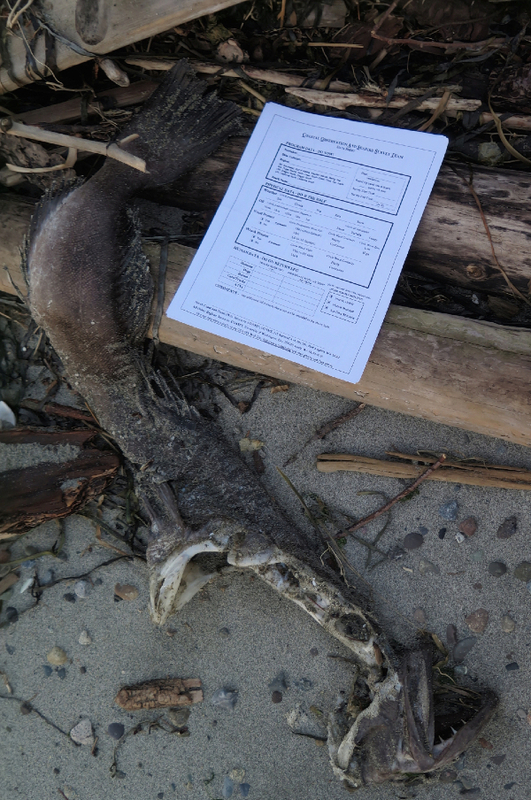 Duane Stevenson, a NOAA Fish Biologist, verified this to be a lingcod, as Julia suspected (Great job, Julia!). Lingcod are sometimes called “bucketheads” because they have a really large head and a large mouth. They also have 18 sharp needle-like teeth (shown here in Julia’s photo). Lingcod grow very quickly and reach up to 5 feet in length! 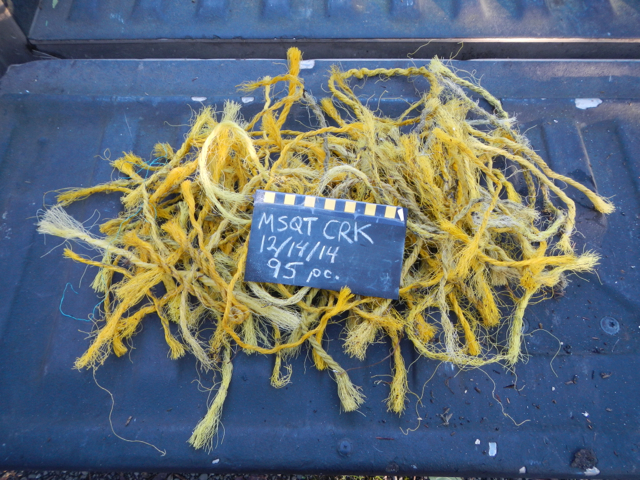 Speaking of fish, Lee and Sue who survey Three Crabs Beach (WA), recently mentioned that a few years ago, they encountered a lancetfish that had washed in. A very cool rare find! 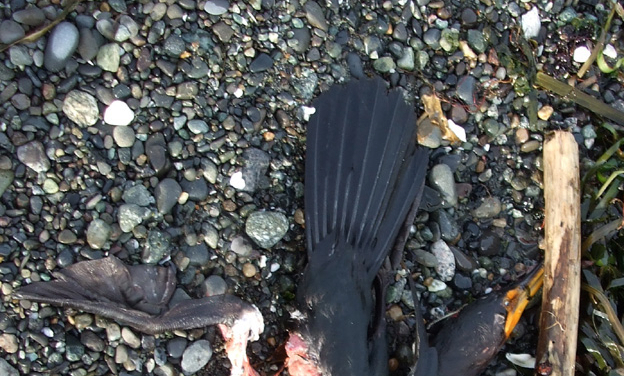 This entry was posted in Uncategorized and tagged Doublecrested Cormorant, Fish, Marine Debris, MEGU on 15. December 2014 by coasst.